My friend, chef Akemi Akutsu, taught Japanese cooking classes at French Mint. While rolling sushi and pleating gyoza dumplings, she shared stories of her life in Japan. Her family grew Shiitake mushrooms so school breaks were spent planting hundreds of Shiitake stems. She recalled neighbourhood parties where freshly picked Shiitakes were pan-fried over an open fire and served with soy sauce and butter. Akemi’s childhood was entirely food-centered; she was taught to brandish a cleaver and chop chickens before learning to write and has the scars from a reattached finger to prove it. This dumpling recipe comes from Akemi’s family who own a restaurant in Tochigi, the dumpling capital of Japan. They serve these dumplings in traditional gyoza fashion, pan-fried and steamed with a dipping sauce of soy sauce and rice vinegar. 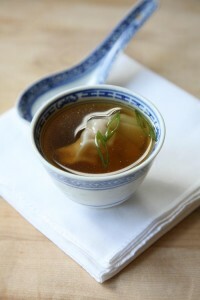 I love these dumplings in soup, specifically a sparking consommé. In a saucepan simmer the consommé with the ginger, lemongrass and garlic for about 30 minutes. Check the seasoning; if you prefer a more pronounced ginger or garlic flavour, leave the aromatics in the consommé for an additional 15 minutes. Remove the ginger, lemongrass and garlic. Just before serving, plunge the dumplings into simmering water* until cooked through, about two minutes. Transfer the cooked dumplings to the warm consommé and garnish with spring onions. *If you’re wondering why I cook the dumplings in water, rather than the consommé, it’s because I don’t want to risk a rogue dumpling bursting and sabotaging my efforts. Once you’ve made homemade consommé, you’ll understand how crazy you can get about keeping your soup clear. There’s no way to make just a few dumplings; this recipe makes about 3 dozen (!) and yes, they freeze beautifully. Combine all but the gyoza wrappers in a bowl and mix together. Place a small spoonful of the mixture in the middle of a gyoza wrapper. Dab a little water around the wrapper’s edge then fold the wrapper in two to encase the filling and create a semi-circle. Pinch or pleat the sides together and repeat with the balance of the dumplings.